With a love of leg and horse power, creating a workspace fit for two purposes presented quite a challenge. 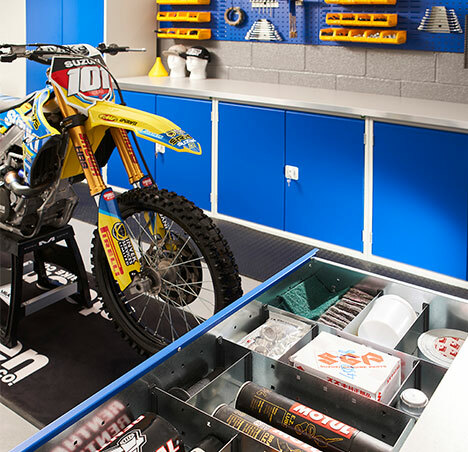 Stolen BMX required a stock area to store parts and build their pedal power bikes, while SR75 needed a functional area to build competition-ready motocross bikes. For Anthony Revell, Co-owner and Director of Stolen BMX, and Geoff Walker, Owner of SR75 World Team, the wide choice of product led them to select Verso as their workplace solution. The modular Verso system has such a diverse range of sizes and options it allowed them to confidently configure their own design; creating two bays to work on both BMX and motocross bikes. A combination of shelf cupboards and 100% extension drawer cabinets provided plenty of storage possibilities, with adjustable drawer dividers optimising organisation throughout. Wall mounted Perfo panels and hooks offered easy access and visible tool storage, alongside plastic hook on bins for small parts storage. With style and reliability being everything in racing, the sleek aesthetics of the Verso range in gentian blue, coupled with great engineering, resonated with Stolen BMX and SR75 World Team. For people living in the high-speed world of extreme sports, the fast delivery time offered by Bott appealed to the teams, getting them up and running quickly; allowing them to get on with the job. In the gruelling sphere of extreme sports, you need to be strong, your kit has to be tough and you need a durable workspace that can handle the pace. For Anthony and Geoff, their Built to Last Verso workspace solution has met all their expectations. “We would highly recommend Bott products. The quality and value for money are second to none.